The Mrs. Fisher: 10 Things to Tell You - When Do You Read? 10 Things to Tell You - When Do You Read? As I mentioned yesterday, Laura Tremaine has a new podcast based on her blog - 10 Things To Tell You. Each week she gives a prompt. Listeners are then encouraged to journal, or blog, or engage on social media, or chat with your friends about the prompt. 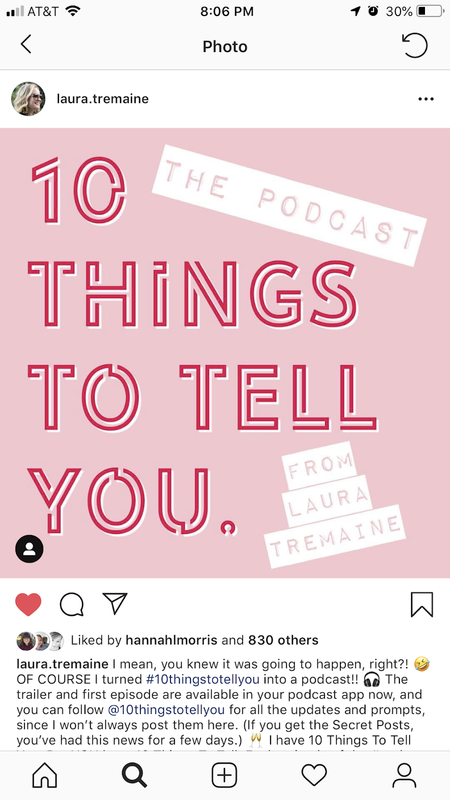 It's a great listen and I absolutely love Laura. Especially when the first topic was revealed. I have a natural affinity for reading. It's just there. When I was a kid, Mom would tell us to go outside and play. She didn't really care what we did outside (this was the 80s and we knew everyone on our street), so I would grab a book and sit under a tree and read. Mom discovered and Mr. Fisher has since discovered, that when I am reading I get hyperfocused to the point that I tune everything out. Everything. You could be sitting next to me trying to have a conversation and I won't hear you if I'm in the middle of of an article or a book. So when do I read? Whenever I can. I try to read for at least twenty minutes every night before bed. I find it relaxes me, it gets me away from computer screens, and it helps me be in the right frame of mind to fall asleep. As someone who struggles with sleep on occasion, find ways to get into that sleepytime mode is crucial. I'll read more on the weekend, maybe an hour or two on Saturday and Sunday depending on what we have going on. Now that football season is over, I'll have a bit more time to spend on books. If I am eating lunch out of my office I'll read on my iPad or my phone through the Kindle or Nook apps. I always have multiple books going at once. If I'm waiting in line at the DMV or waiting at the doctor's office, I'll read a bit there too. I read when I travel - poolside, on a plane, on the balcony, at the beach. I can plow through a fair bit when on vacation. I also get asked - eBook or hardcopy? I will read both. I have purchased plenty of eBooks but over the course of my 41 years have spent more time reading hardcopy books. I don't prefer fiction over non-fiction - I love them both. Classics, new fiction, memoirs, events based non-fiction, I love it all. The only genre I generally do not get into is sci-fi/fantasy. Other than that, everything else is fair game. So tell me, when do you read? We have a lot in common. I also try to read before bed and always have a book with me, just in case. I prefer "real" books but also have an ereader. I 've been a reader since I was a child and even read to my pregnant belly with both my boys. I plan to read a lot to this little one on the way!